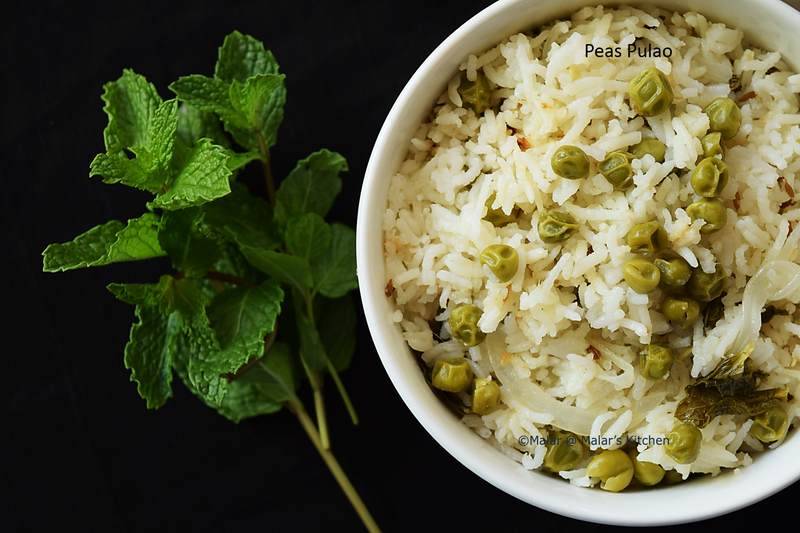 Peas Pulao is another easy lunchbox menu. Quick to make and tastes great. Mint leaves is the secret ingredient in this pulao, it gives a great flavor. Wash basmathi rice and set aside. Heat oil in a pan, when hot add cumin seeds. Let it crackle. Add onions saute for 2 mins. Now add ginger garlic paste. Make sure to saute well. When onion turns translucent, add mint leaves and saute for 2 mins. Add peas and saute for 2 mins. Now add the washed and drained rice. Saute for 2 mins. Now transfer it to a electric cooker and add water, salt and cook till done. In case of pressure cooker, cook for 3 whistles. Or cook in a pan as well till fluffy. 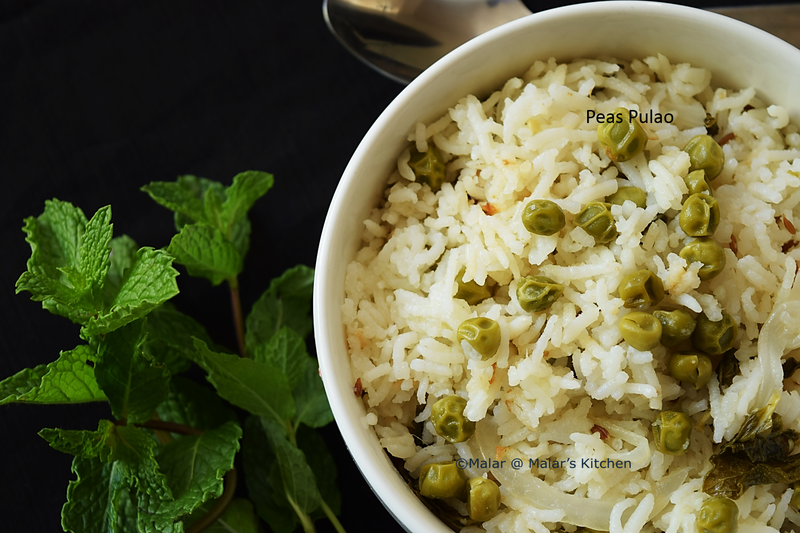 Easy pessy peas pulao/pilaf is done 🙂 Serve with dal tadka or any raita. This is one of the spicy kuzhambhu from south. This gravy can be had when you have sore throat, cold. It helps reducing the throat infection. Also this is one best food for nursing mothers. It helps increasing the breast milk. 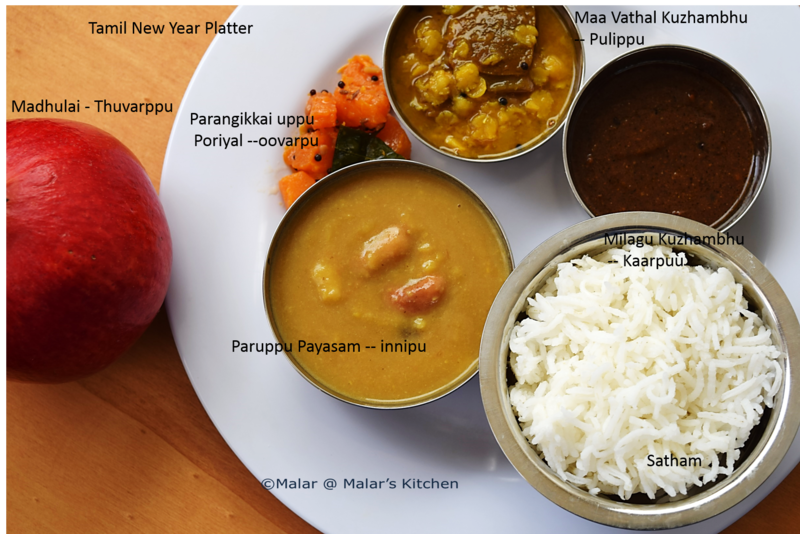 I made this for the Tamil New year as we need to make one spicy food on that day. Soak tamarind in little water. After 5 mins, put it in a microwave container and heat it for 30 sec. Remove and keep it aside. Heat a teaspoon of oil in a pan, add milagu, coriander seeds, urad dal, channa dal, cumin seeds, red chili. Let it crackle and turn golden brown. Let it cool , once cooled down add salt and grind it to a fine paste with required water. Now heat remaining oil in a bigger pan, when hot add mustard seeds, asafoetida. When it crackles add curry leaves. Now add the ground mix and mix well. After 5 mins, add the tamarind paste and mix. Heat it for 15 to 20 mins, close it with lid so it doesn’t splutter. If you feel it is too hot/spicy, then you can add some coconut around 2 to 3 tablespoons to the items while frying at the end and grind it along. Adding some more gingelly oil as well helps reducing the hotness. Chop red pearl onions, tomato, garlic. Add red chili with these. Grind it to a fine or coarse paste with required water. 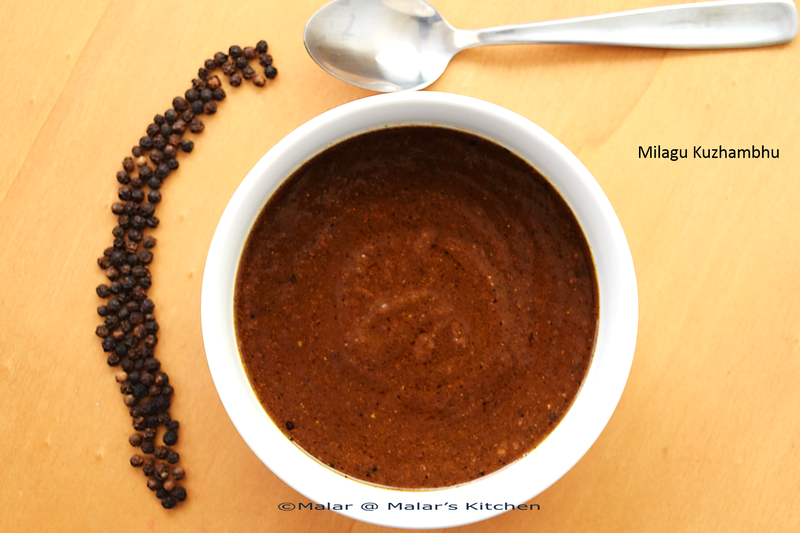 Heat oil in a pan, add mustard seeds and urad dal when hot. When it crackles, add curry leaves. Now pour the ground paste. Add salt to it and let it get cooked. It might splutter, so cover it with lid. Cook till all the water content gets dehydrated. It takes around 30 mins to dehydrate. 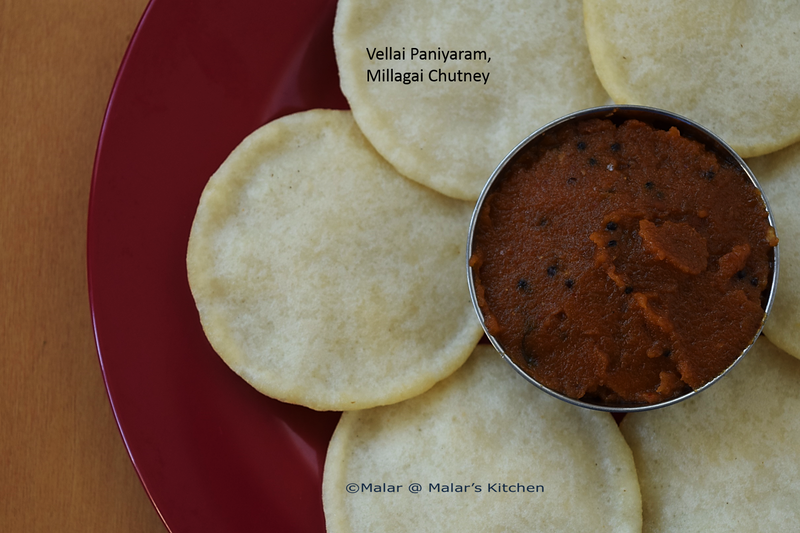 Serve with paniayaram , idli or dosa. 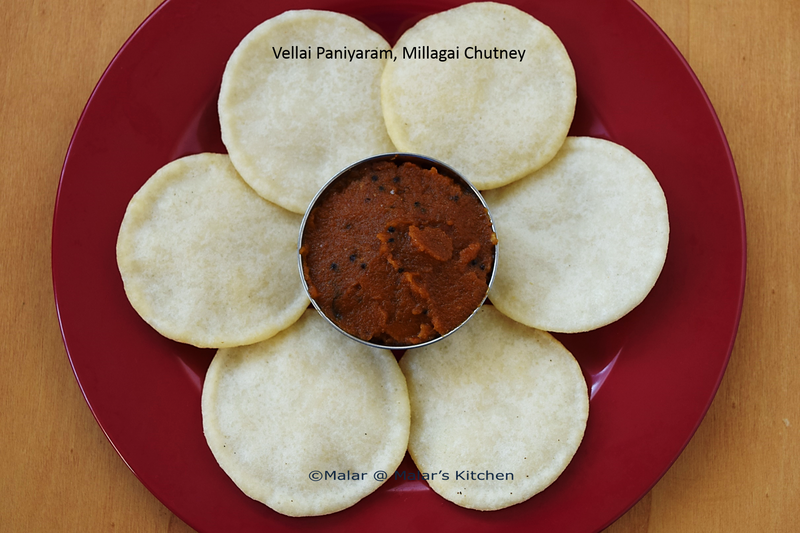 Here comes my 200th post, with the chettinad special dish vellai paniyaram. In any chettinad house this dish is inevitable. 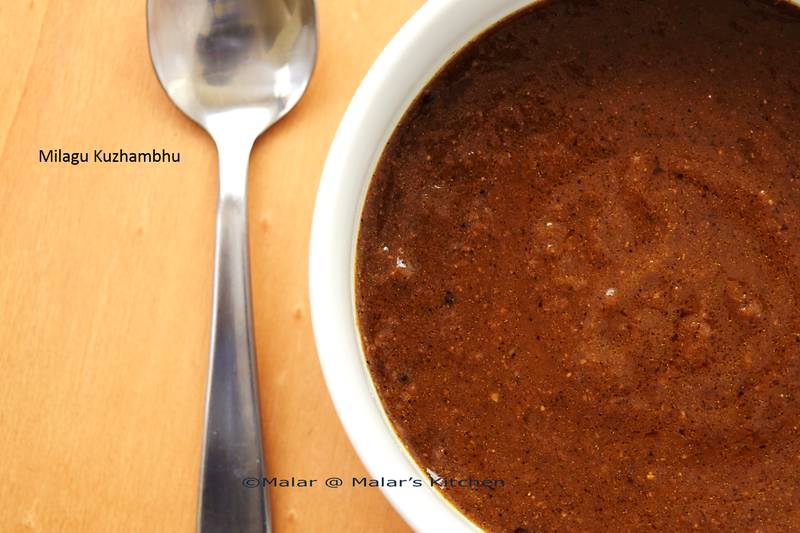 This is served in all of the chettinad functions. You will find this as one of the breakfast items in marriages. It is a very simple recipe, but needs some practice. I have tried it a few times and never got it right. 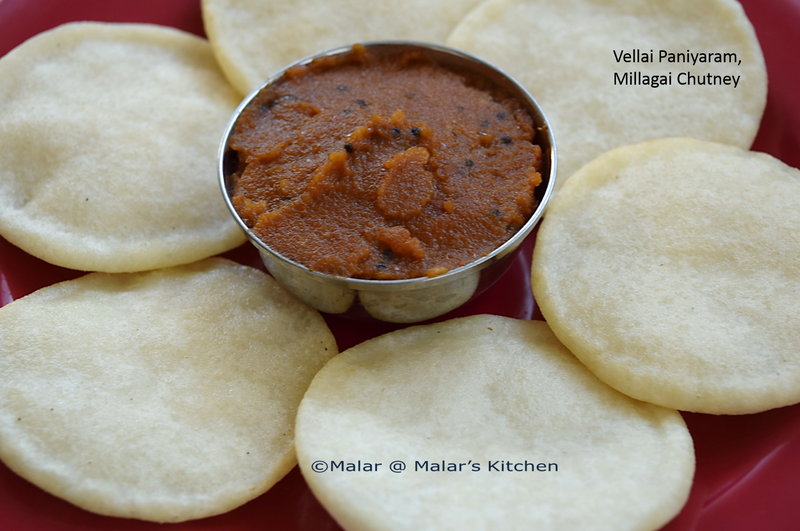 Finally I could nail it 🙂 It is always accompanied with the spicy millagai chutney (Red Chili Chutney) , recipe in the next post. 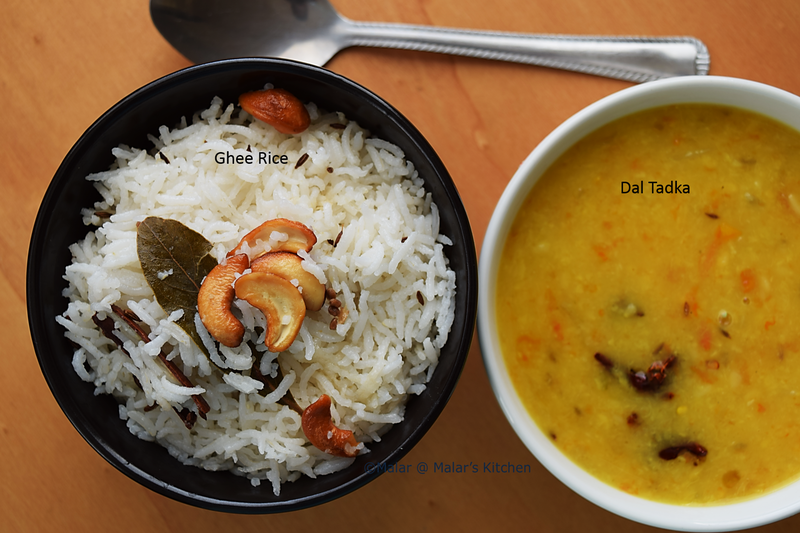 Soak rice and urad dal in water for 2 hours. 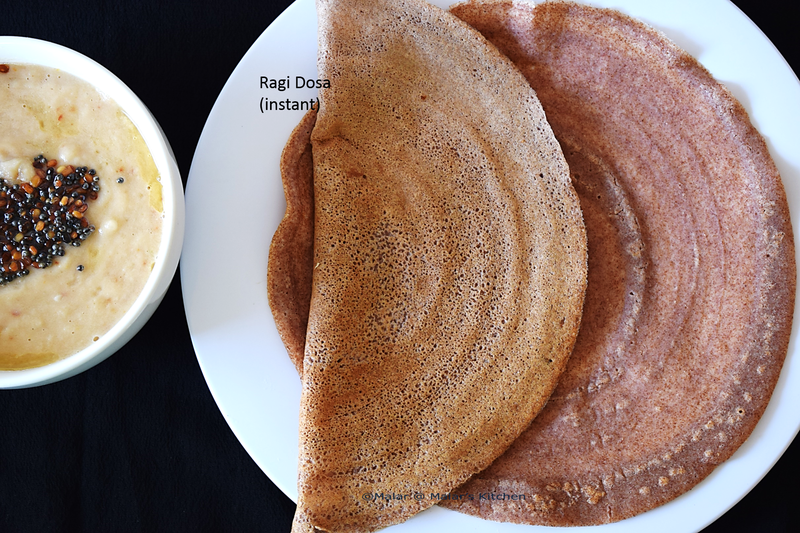 Grind it to a smooth batter with salt, just like dosa batter. This batter needs to be a little extra watery than dosa batter. So you can add extra milk and bring it to that consistency. When the oil is hot enough, in the ladle take the batter and make sure the bottom of the ladle doe not have any batter. And pour it in one place. With another ladle, pour oil on the top of the paniyaram. Let it get cooked for a minute. Now turn the sides and cook around 30 sec. Drain oil and place it in a paper towel to drain extra oil. This paniayaram should be thin and not thick, you can see the last picture on how it looks when cooked. Once the first is cooked , tear it and see if the center is cooked well, if not then cook for some more time. This paniyaram has to be cooked one at a time and not more than one. Do not over cook once the side is turned. They must look white and not brown, hence the name vellai paniyaram. This batter can be prepared and stored for later in fridge. Make sure to have a little watery consistency than dosa batter. 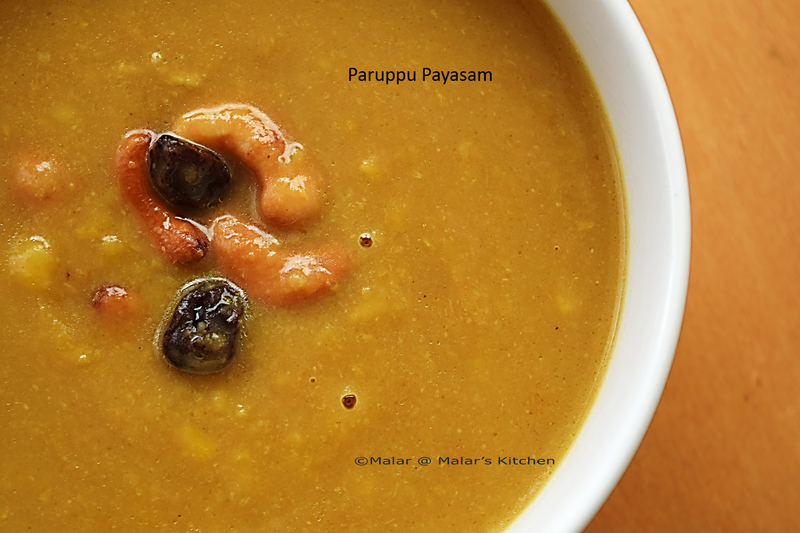 In case urad dal is very good quality, these paniyaram might come out very thick and like a ball. 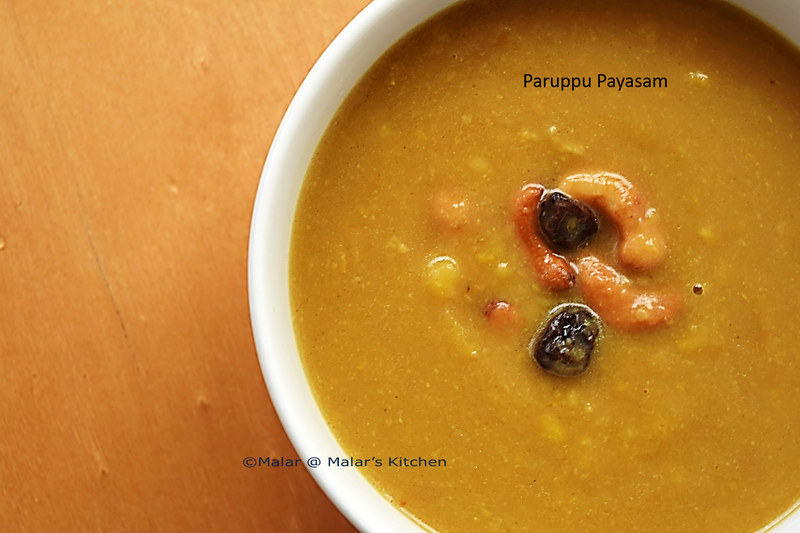 In case Urad dal is too less, then paniyaram becomes very thin and rubbery. In this case you can add some urad dal flour and adjust. 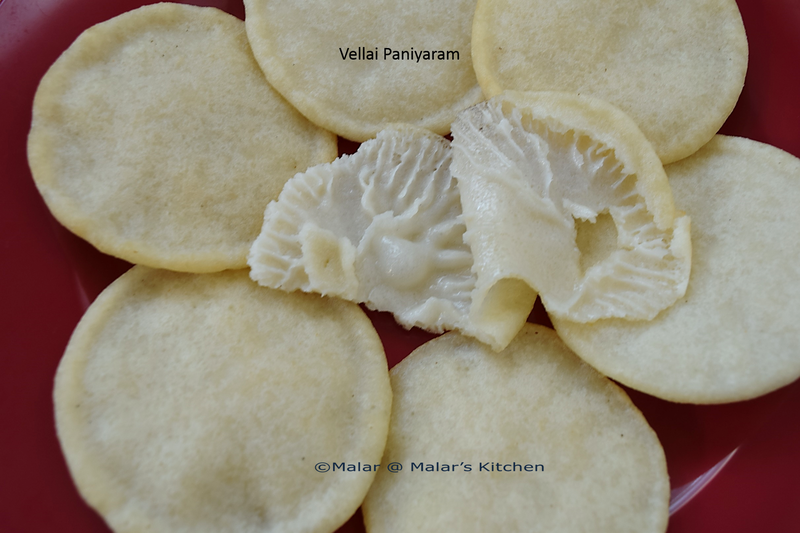 The sides of this paniayaram will form a flower shape which is the exact shape of this paniyaram. 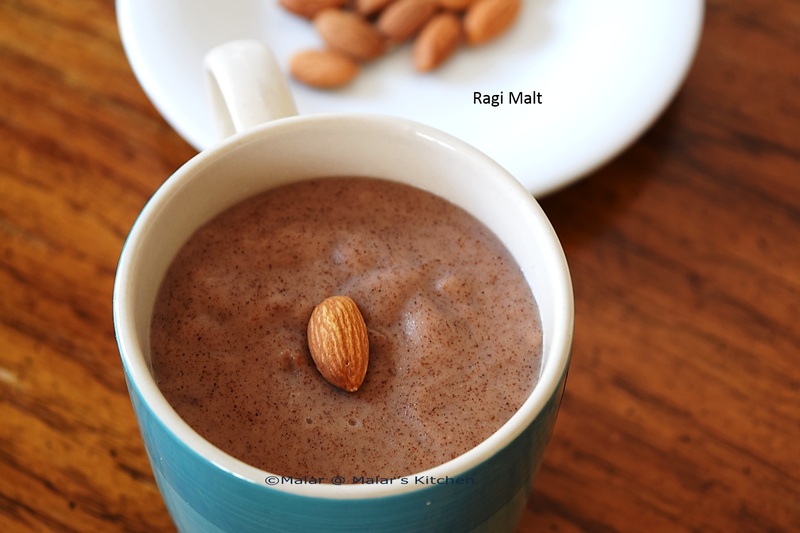 Ragi malt is something quite heavy for breakfast and an apt one 🙂 It is so filling with just one cup. It doesn’t take more than 10 mins to prepare this recipe, so you can make it quick and easy. For a fast paced morning, this is a perfect recipe!! 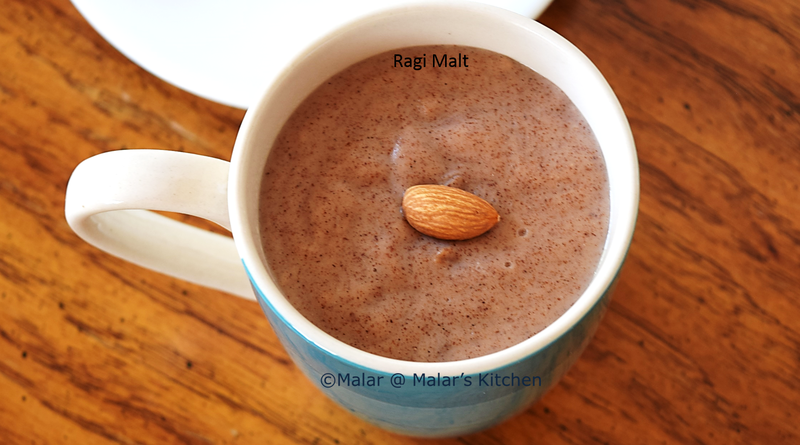 Dry roast ragi flour for 3 to 4 mins. Make sure it is not burnt. 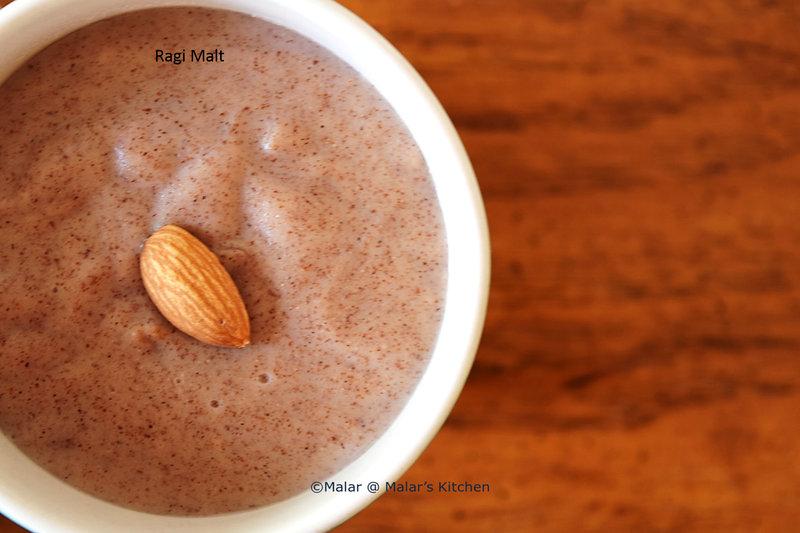 Now mix ragi flour with water and make a paste without lumps. Now add milk(also almond milk in case using this), cardamom powder, jaggery. Mix well. It should be little watery. Heat it in low medium flame. Keep stirring, otherwise lumps will form. It would become thick. It takes around 5 mins. Almond milk gives an excellent taste, So I would totally prefer to add it. I am a little late in wishing everyone a very Happy Tamil New Year and Vishu. 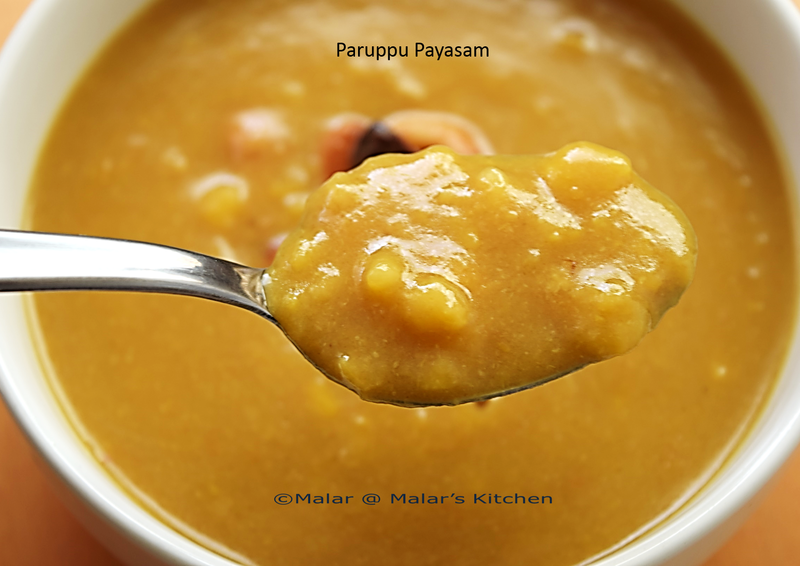 Anyways never late, here is an authentic payasam recipe for the celebration 🙂 As a tradition we make arusuvai unnavu on this special day, which mean all the six taste is incorporated in food specially. I made few and adjusted a few 🙂 here is what I made on this special day. 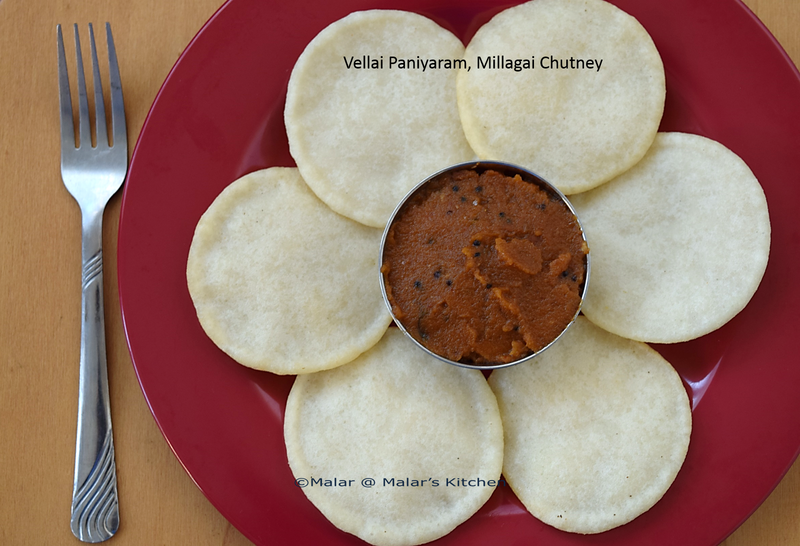 Recipe for Maa vathal Kuzhambhu, Vendhaya dosai, milagu kuzhambhu is coming soon…. I made a vegan version of this recipe for the first time and turned out well. Pressure cook pasi paruppu/moong dal with water and turmeric powder for 3 to 4 whistles. Let it cool. 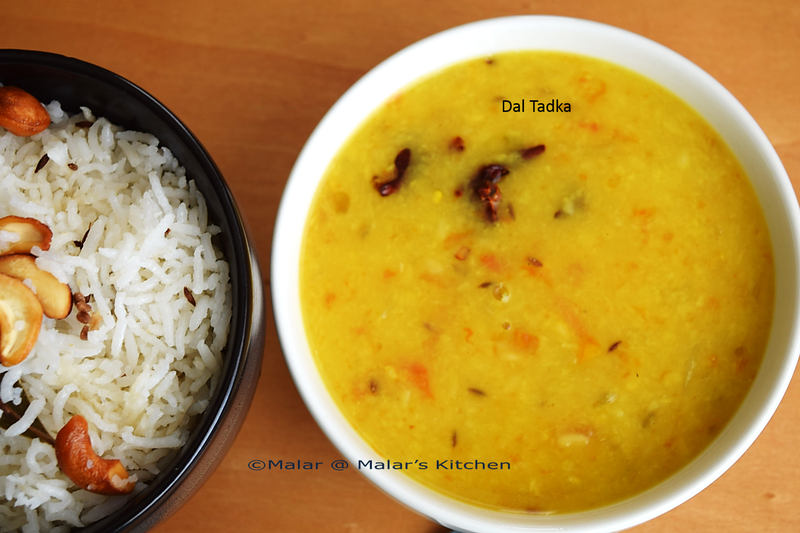 When pressure subsides open the cooker and make sure dal is cooked well. Now add coconut milk and let it come to boiling stage. Heat jaggery with 1 to 2 tablespoons of water. 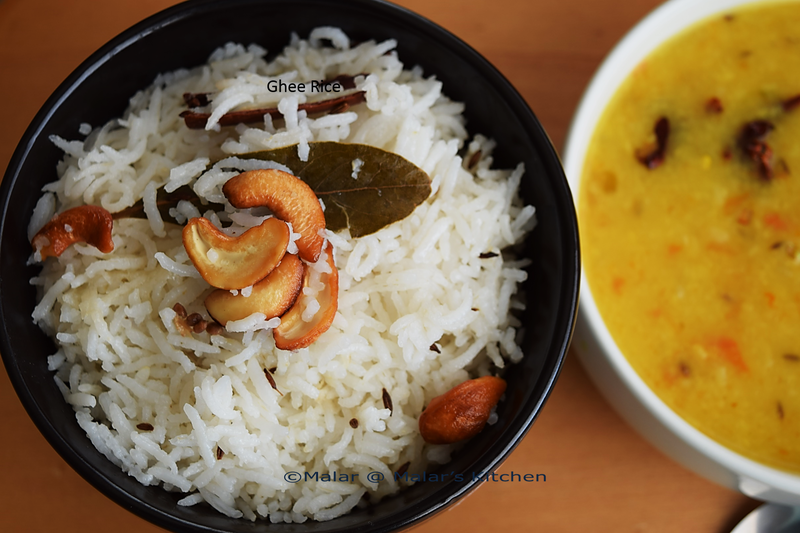 When it starts melting and heating, pour the mix through a filter over the cooking dal and coconut milk. Let it heat for another 3 to 4 mins. In a small pan heat coconut oil, when hot add cashews. When they turn slight golden brown, add raisins let them pop. Once popped add it to the payasam. Stop and serve either hot or cold. Wash rice, add cinnamon stick, cardamom, bay leaf, cloves and water. Cook with 2 cups water either in pressure cooker or electric cooker or in open method. When hot add cashews, jeera. When it turns golden brown, stop. Add it to the cooked rice, mix with salt and combine well. Clean and wash moong dal. Chop onions, green chili, garlic and tomato. Pressure cook all these together with turmeric powder and water for 3 to 4 whistles. Once done, stop and let the pressure ease. 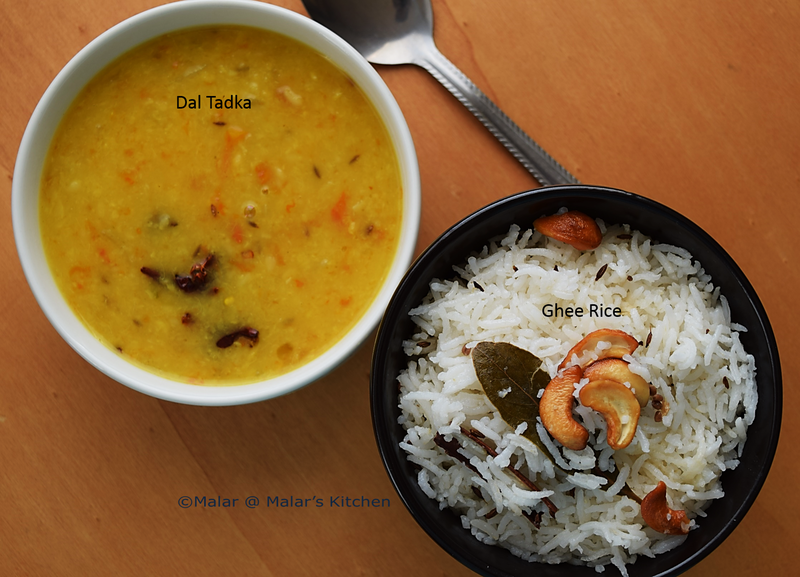 When pressure eases, open the cooker, add salt and mash the dal well. Heat a pan with oil. When hot add cumin seeds, asafoetida and red chili. When it crackles, add curry leaves and finally add it to the cooked dal. 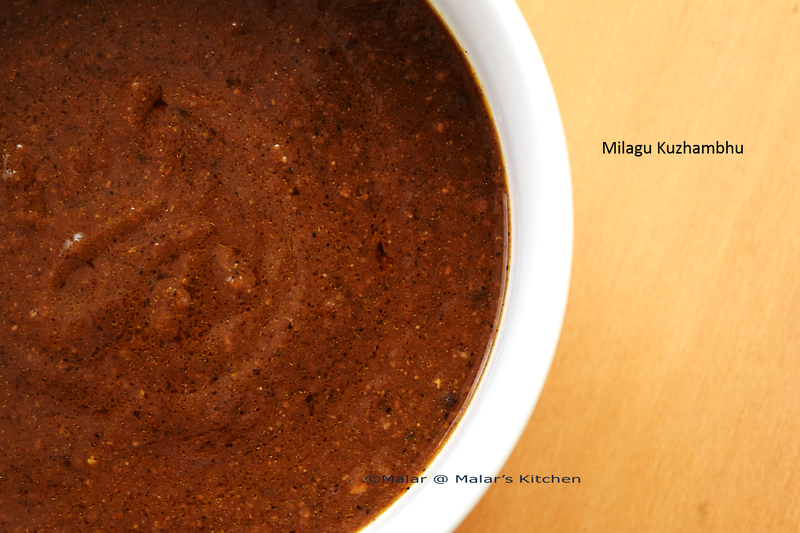 This goes great with any variety rice, chappathi or paratta. 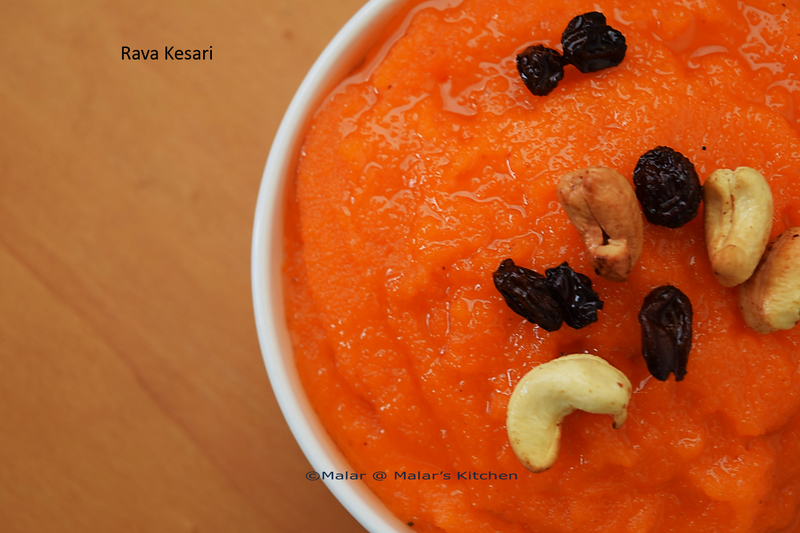 Rava kesari/Sooji Sheera is one of the easiest and yummiest Indian sweet which can be prepared very quick. Whenever I need to prepare some sweet as neivedhyam for pooja specially in the mornings ,this is my first choice. You can make a lot of variations in this with fruits. You can use Mango/Banana to get the extra punch 😉 For my earlier post on Mango Kesari, check here. Heat 1/2 tablespoon of ghee, when hot roast cashews first. Next add raisins when it pops, remove and set aside. In the same pan, roast rava/sooji for 2 to 3 mins, until nice aroma rises. Do not over roast, set aside. Now heat water in a large pan. Add the food color, saffron strands if using. Let it get heated well. Now mix the roasted rava and continuously stir. Rava will absorb all the water, make sure it gets cooked really well. Now add sugar and mix. Sugar will leave out water. Keep stirring. Add ghee as well. 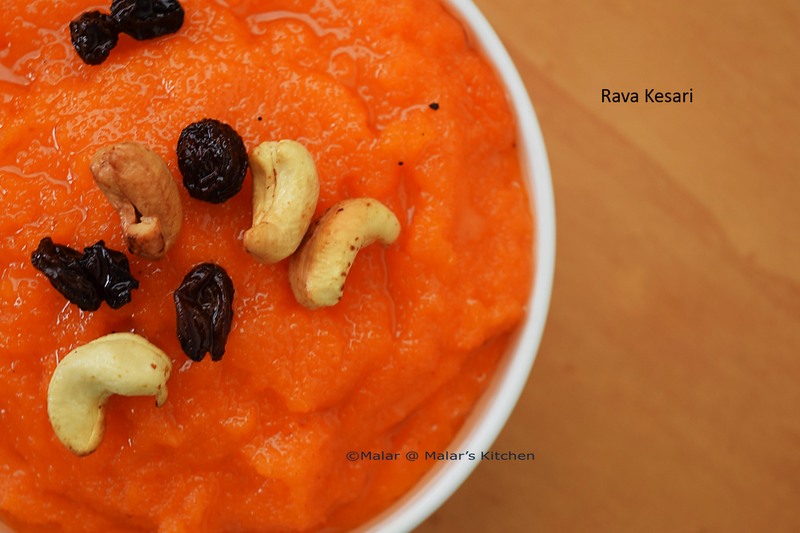 Mix and in a bowl grease some ghee, pour this rava kesari and mix the dry fruits. It gets thicker by time. 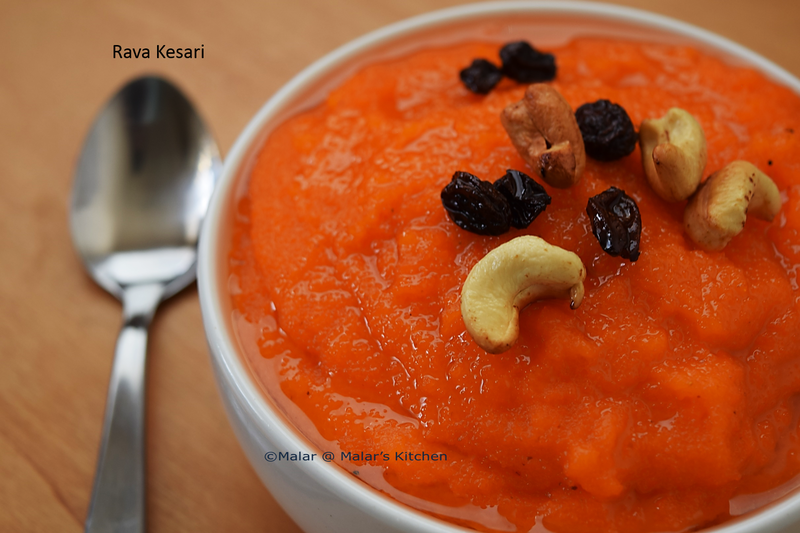 4 cups of water gives perfect soft kesari. I usually use 1 cup rava and 2 cup water, which makes it feel very dry when stored later. 4 cups water ratio works wonder and it stays real soft after long hours. 2 cups water and 2 cups milk can also be used. Food color is totally optional. 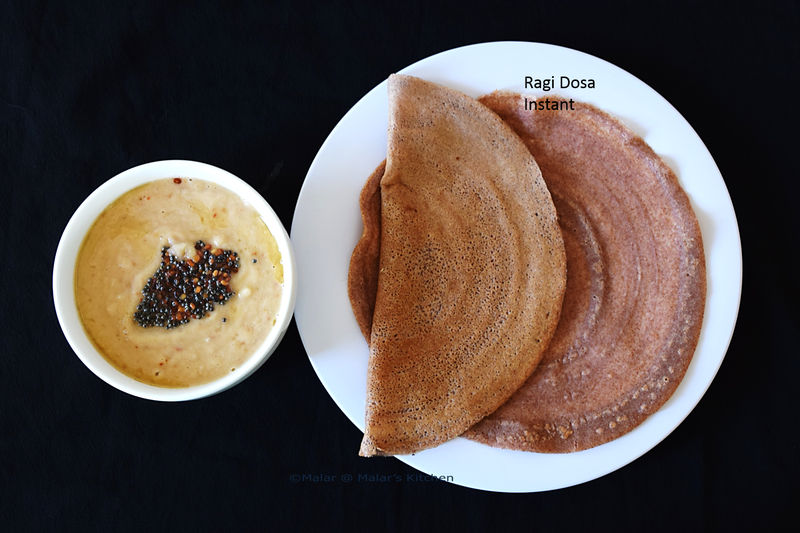 I tried these instant ragi dosa’s and they came out really good. We absolutely enjoyed these dosa’s. This batter need not be fermented. We just need to have the urad dal paste ready. I served it with onion chutney. Soak urad dal for 45 mins to 1 hour. Grind it to a fine paste. Mix ragi flour, rice flour and urad dal paste. Add salt and water and mix it to dosa batter consistency. Now pour this batter and drizzle oil over the dosa. After 2 to 3 mins flip side and cook. I have added very little oil, you can add more oil to make it crispy.